The Mayor of Seaford’s Fashion Show! 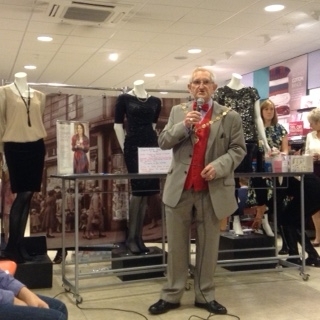 On 26th November, the Mayor of Seaford Mark Brown organised a fashion show at M&Co in Seaford in aid of his two chosen charities, WAVES, a family support charity based in Church Street and Seahaven Storehouse, a food bank based at Kings Well Vale Road. The evening began with the Bond School of Dance, for ages 3 and up, giving a fantastic performance to ‘We’re in the Money’ from the musical 42nd Street. The younger models then entered the catwalk modelling a range of children’s wear followed by the adults modelling a range of ladies and men’s wear. It was a great evening for everyone involved with a raffle, an auction of a cake made by Seahaven Storehouse followed by nibbles and wine. The Mayor would like to thank Matt Evans, Manager at M&Co and all of the staff for hosting this event and to all the models who took part to make this event possible. The total raised from the sales of tickets and raffle was a fantastic £599.96!! The Mayor would also like to thank the Bond School of Dance who filmed the event to produce DVDs which will be sold with all sales also going towards the Mayors charities.